The article formulates the law of preserving the general goal as an analogue of the physical laws of conservation, which is applied in designing complex systems with self-awareness, surpassing the researcher in perfection. Seven consequences from this law are presented, they are used for combat planning and control in the conditions of post-industrial war. The principle of action and the role of psychogenic plague as a binary genetic and epigenetic weapon in managing evolution for military purposes are described. Denisov A.A., Denisova E.V. 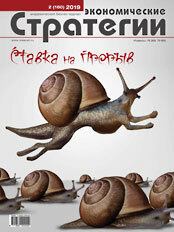 O novom obraze budushchego [About the New Image of the Future]. Ekonomicheskie strategii, 2016, no 1, pp. 118–133. Denisov A.A., Denisova E.V. Tsel’ i kharakter postindustrial’noi voiny. I. Model’ pamyati dinamicheskogo samoosoznaniya [Purpose and Nature of Post-Industrial War. Memory Model of Dynamic Self-Awareness]. Ekonomicheskie strategii, 2017, no 7, pp. 78–93. Denisov A.A., Denisova E.V. Tsel’ i kharakter postindustrial’noi voiny. II. Dva “predel’nykh” strategicheskikh sub”ekta [The Aim and Nature of Post-Industrial War. Two “Ultimate” Strategic Subjects]. Ekonomicheskie strategii, 2017, no 8, pp. 132–147. Denisov A.A., Denisova E.V. Kratkii ocherk osnov teorii upravlyaemoi konfrontatsii [Brief Outline of the Foundations of Controlled Confrontation Theory]. Informatsionnye voiny, 2014, no 1, pp. 24–33. Van Gig Dzh. Prikladnaya obshchaya teoriya system [Applied General Systems Theory]. V 2 t. Moscow, Mir, 1981. Denisov A.A., Denisova E.V. O proektirovanii strategii v postindustrial’nom netsifrovom mire [On Designing Strategies in the Post-Industrial Non-Digital World]. Ekonomicheskie strategii, 2016, no 8, pp. 132–145. Denisov A.A. II. Osnovy metrologicheskogo obespecheniya upravleniya konfliktom na geotsentricheskom TVD (“Prizrachnye sub”ekty”) [Fundamentals of Metrological Support of Conflict Management in Geocentric Theater of Operations (“Ghost subjects”)]. Informatsionnye voiny, 2011, no 3, pp. 33–44.